Looking for a NZ family adventure activity to delight everyone from your three-year-old to your grandpa? 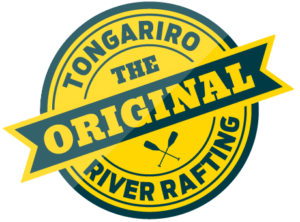 Grab your swimwear, head to beautiful Turangi (close to Taupo) and jump on board one of our Family Floats rafting adventures, where you’ll experience the clear, pristine waters of the Tongariro River. We know how lucky we are to live in a region filled with glorious mountain scenery, pristine rivers, and native forest to die for. It’s the perfect place to step away from big city life and introduce the kids to the amazing Kiwi Great Outdoors. There’s heaps to see here, but what if you want to have an exhilarating outdoor adventure together? A lot of the once-in-a-lifetime experiences that you can do here aren’t suitable for younger visitors due to age and safety restrictions – think jumping off a bridge our out of a plane – great for mum or dad, not so great for the little ones! We know options are limited for outdoor-lovers with young families. You need activities that won’t tire out the little ones while still being exciting for bigger kids (and their parents of course). That’s why we put our heads together to create our Family Floats rafting experience – a genuine adventure activity that the whole family can enjoy and participate in. One adventure-loving family – kids as young as three are welcome. 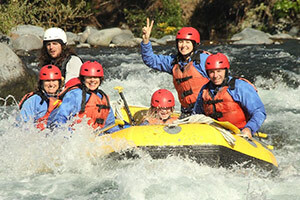 Around an hour and a quarter of exciting rafting on a carefully chosen stretch of water that the adults will enjoy but the kids will feel they have had an epic adventure. Why come on a Family Float? As well as seeing the beauty of the region, you’re actually getting out there together and paddling your way through it as a family. Children as young as three can join the fun, and anyone in the family can paddle as much or as little as you like thanks to your wonderful rafting guide who will be with you all the way. 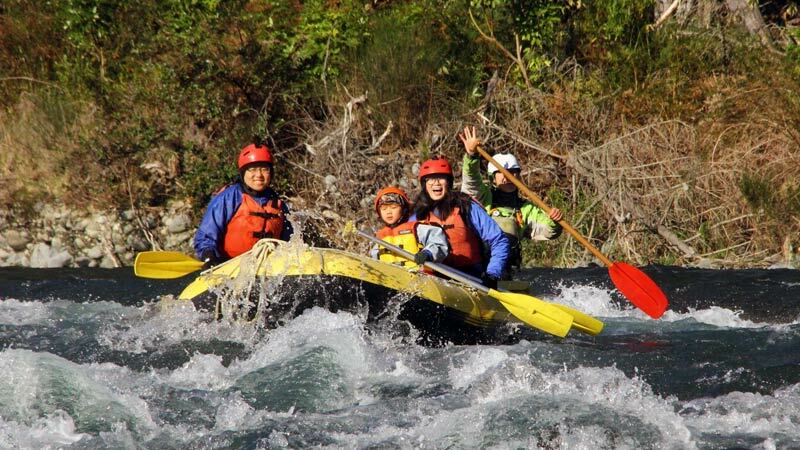 As a family company, we love it when kids come rafting with us. There’s nothing like the excitement on their faces when they discover that they have the power to help steer the raft and make it move. Our experienced guides will gently encourage those with first time nerves. We’ve carefully selected a Grade 2 section of the river where there are plenty of bouncy splashy spots for maximum fun, but no big rapids to worry about. Our neighbours on the river, the Whio (Blue Ducks), are beautiful birds threatened with extinction. You’ll see where they live and find out all about them from your guide, including how we can help their numbers to grow. We’re so passionate about this little native duck, that we started our own conservation project dedicated to saving them. Seeing them in the wild is so much more special than visiting a sanctuary. With New Zealand’s native birds calling to each other from the trees around you, your family rafting adventure will have a stunning soundtrack! The Tongariro River is one of the best trout-fishing rivers in the world. Brown and Rainbow Trout come here in their thousands, and with our beautifully clear river water you can often spot them coming and going. If the kids want to catch one for dinner, we have a Family Float and Kids Fishing activity combo – you can even have your catch filleted and smoked for you! Forget indoor activities on rainy days – the river is where it’s at! You’ll be wearing wetsuits and splash jackets so you’ll hardly notice a little extra water falling from the sky. This makes rafting an awesome winter family activity too. If you’re on a ski trip at nearby Whakapapa and the mountain is closed due to weather, give us a call and we’ll see where we can fit you in. We have cosy fleece layers to wear under your wetsuits so don’t worry about feeling the chill. Whether you’re aged five or fifty, we know that you’ll always remember the excitement of your first time on the rapids. That’s why we film the experience for you, and station our trusty photographers along the riverbank to capture some of those magic moments for you. When you’ve dried off back at our base, you can grab a warm drink and see the images of your smiling faces on screen before deciding what you’d like to buy and take home with you. Our expert guides will give you a clear, easy to follow safety briefing before you hit the water, and they’ll be in charge of the raft at all times. In fact, you don’t even need to paddle if you don’t want to! The location we’ve chosen is a Grade 2 section of the Lower Tongariro River. This means it’s been assessed as having gentle currents, small to medium rapids and no major obstacles. Because this part of the river is nice and wide with lots of calm sections, your guide has some leeway to make the trip a bit more bouncy or a bit less splashy according to everyone’s wishes. If this sounds like the trip for you, book online now and come and see us for an unforgettable half day of awesome “Kiwi as” family fun with the most experienced operators on the Tongariro. We’re under 40 minutes from Taupo and the Whakapapa ski fields, and if you’re in Hamilton, New Plymouth, Rotorua or Napier we’re a great day trip option for escaping the city.